Shut The Fridge: Truth...It Is Out There. I just read a book about truth. Yes, the truth is out there. 25 Truths, to be exact. 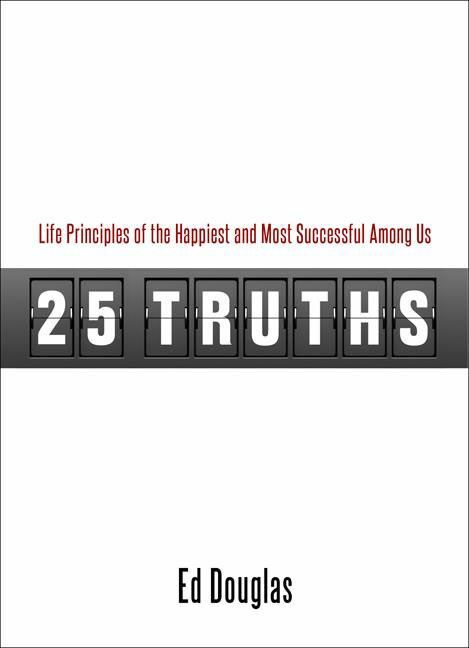 It is called 25 Truths - Life Principles of the Happiest and Most Successful Among Us. I loved this little, almost pocket sized book. I sat down and read the whole book myself and then got D-man and A-girl involved, because it was recommended for grades 6 through 12. This book is about character, values and what is important in life based on Christian principles. Each truth is very concise (which I think makes young people more willing to read them) followed by discussion questions to promote conversation between parents and their children and/or teachers and their students. There is a crisis of character in our country, and my hope is that this book can be used as a homeschooling tool to change the world, one person at a time. I agree with the author, Ed Douglas (whose background is mainly in banking and coaching high school tennis). I do believe there is a crisis of character right now. I too hope that the things we are doing as parents and as homeschoolers, can help change the world, one person at a time. Each chapter covers a truth. Mr.Douglas shares the general idea behind the truth and then, always shared an example from his life that inspired the truth. At the end of each chapter ( and by "chapter", I mean a few pages of reading) there are some discussion questions. They would start with generic ones like, "Do you agree with this truth?" or "Do you think this truth is important?" "Why or why not?" And then moves into looking at your own life and what the truth really means a little more deeply. I did things a little differently with D-man and A-girl. I didn't go through the book in numerical order. I jumped around and we covered the truths as they were needed. For example, if, hypothetically speaking of course, D-man said something negative about A-girl (thinking he was funny), but it ended up really and truly hurting A-girl, that would have been (was) the best time to talk about Truth # 6 - Don't Talk Negatively About Others. Or Truth #5 - Tell The Truth. This one has been talked about at our house quite a bit. Rainman and I have always told the kids that, if they tell the truth....even if it reveals something bad...that they will get in less trouble than if they lie to us....because we usually end up finding out the truth sometime. This truth in Mr. Douglas' book was given new meaning by his using an example of one of his employees telling a little while lie and after being found out, was fired. There are consequences to actions, there are consequences to what you allow your reputation to be. Somedays I went through the chapters invididually with each of them, if I thought the discussion topics were going to get personal. Other days, if I felt the discussion wasn't going to be super personal, the three of us did them together after our family Circle Time (which I will discuss another day). I will say that not every discussion was deep and meaningful.....although some days were. There were days where we went over the Truth, talked through the discussion questions, and most of their answers were something like, "Yes." "I don't know." "I will have to think about it." Or, the occasional, "Yes! I know, mom!" (followed by a subtle, yet meaningful, eye roll). But, I think and hope that even on those days where they didn't have much to add to our discussion, that I was planting seeds of thought in their heads. Seeds that hopefully will grow into conclusions and convictions that will create people of great Christian character. These truths were a good conversation jump off point for me to share stories from my past of perhaps things that didn't go so well for me when I tried certain things, or even cautionary tales of friends of mine. You can buy this great, 150 page, pocket sized book, for $12.50. Ed Douglas has a few other books related to financial management and saving money that seem pretty interesting too, especially considering his background in the banking world. Might be worth checking those out too. Go see what other TOS Reviewers thought of 25 Truths.